On this episode of Modiphius Calling, our guest is Jay Little: Lead game designer for Mutant Chronicles 3rd edition, Kickstarting now. Jay gives us a sneak peek ar the Mutant Chronicles Rules… and talks about his other games: including Warhammer Fantasy Roleplay, Star Wars: Edge of the Empire and Star Wars X-Wing Miniatures. Running time for this episode is 54 minutes. On this episode of Modiphius Calling, we answer your questions about the Mutant Chronicles Third Edition … Kickstarting now. Mischa Thomas has been writing five thousand words a day for the game — he tells us what to expect from The Dark Symmetry portion of the Core Book, and the Dark Soul Sourcebook. And Reuben Saunders reads a horrifying story from the upcoming bestiary for Achtung! Cthulhu: Terrors of the Secret War. Running time for this episode is 47 minutes. 05:49 Mutant Chronicles 3rd Ed. Kickstarter – Your questions answered! Please excuse the reverb on this episode’s dialogue. 00:53 – What is that intro about? Rita Birch explains! 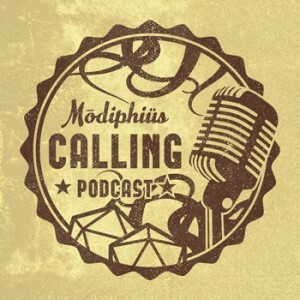 On this episode of Modiphius Calling we’re joined by Lynne Hardy, line editor for Achtung Cthulhu and creator of steampunk pulp RPG Cogs, Cakes and Swordsticks. Jeremy Hogan talks about his Kickstarter hitDreaming Spires which lets you build Oxford University with all the famous names. Plus, hints on running a period game in World War Two or the Age of Steam. 01:14 – News from Modiphius: We went to print with the first books! The Floor Tiles look awesome and Chris visits Battlefront to talk about the DUST rpg with the playtest about to kick off. 05:55 – Interview with Lynne Hardy about lining editing the Achtung! Cthulhu books and Cogs, Cakes & Swordsticks. In this episode of Modiphius Calling, game designer Alex Preston talks about his nostalgic video game RPG, Hyper Light Drifter, a runaway success on Kickstarter. Plus, Charlie Krank tells us about four decades with Chaosium, creators of Call of Cthulhu. Chris talks about Dystopian Legions, the miniatures game from Spartan Games, Love Letter the new card game and Josh raves about his game of New World Disorder from Precis Media. Pandemic and Empire: The Deck Building Strategy Game come to the iPad, and we’ll bring you a wargamer’s guide to Tokyo’s otaku paradise, Akihabara. In Episode 5 we’ll have an interview with Chris Pramas from Green Ronin, makers of the Dragon Age andMutants & Masterminds RPG’s, plus Bradley Cummings from Shenandoah Studios, makers of the Ipad and Iphone game Battle of the Bulge and Road to Moscow.